If you are under the legal smoking age in your state or country, then never use this product. Also, all minors are prohibited from accessing this website and are forbidden from making purchases from this site. Do not use this product, if you are under the age of 18, or 21 in those jurisdictions in which 21 is the age of majority; if you are a non-smoker, if you have or suspect an allergy or sensitivity to nicotine; or if you have any medical conditions, are pregnant or nursing. This product is potentially dangerous. 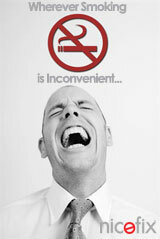 Consult with a doctor before using any Tobacco or Nicotine containing products. Nicofix in NO way intends to diagnose, treat, cure, or mitigate any disease or condition. As you know, smoking causes lung cancer, emphysema, heart Disease, and might cause pregnancy complications. Do your research on the harmful side effects of n icotine before purchasing Nicofix . If for some reason its illegal to enter this site in your community, state, country, then please leave immediately. These products are not considered an aid to help you quit smoking. Nicotine is highly addictive and Nicofix has not been approved by the United States Food and Drug Administration ( US FDA ). These products in NO way claim to be helping the user in quitting or decreasing the frequency of smoking traditional tobacco cigarettes. Keep these products and parts away from the reach of children. You may NOT make a purchase from any links leaving this website if you are under the age of 18 or 21 (depending on individual state or country laws regarding adult subject matter), or are under the age of majority in the jurisdiction where you reside or from which you access this website ( the actual physical location where you are located ). *By clicking to order, you agree to our terms and conditions. No Statements & Comments for the products mentioned on this website have been Evaluated by the United States Food and Drug Administration (US FDA). No product on this website is intended to Diagnose, Treat, or Prevent any Disease. Before using any of the products mentioned on this website, check with a qualified healthcare professional before taking or using any of any of the products on this website, if you are pregnant, nursing a baby, under 18 years of age, are addicted to smoking, if you are a smoker, if you are thinking about starting to smoke, if you have any known or suspected medical condition(s) and/or are taking any prescription or OTC medications, and/or have any allergies toward this/these products on this website. These statements have not been evaluated by the FDA and are not intended to diagnose, treat, cure, or prevent any disease. Please consult your physician before beginning any program. If there is a change in your medical condition, please notify your conselor immediately.